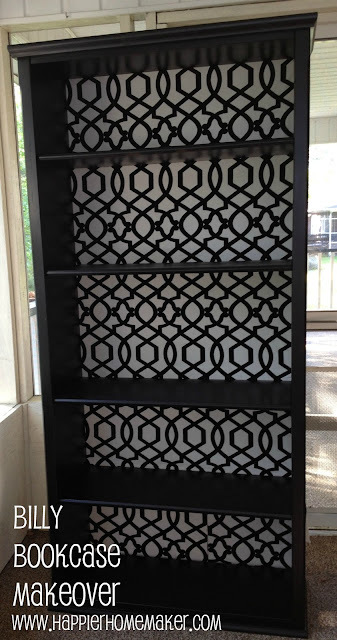 Since my last post was about IKEA I felt it would be a good time to show you a makeover I did on another IKEA purchase recently-the ever popular Billy Bookcase. 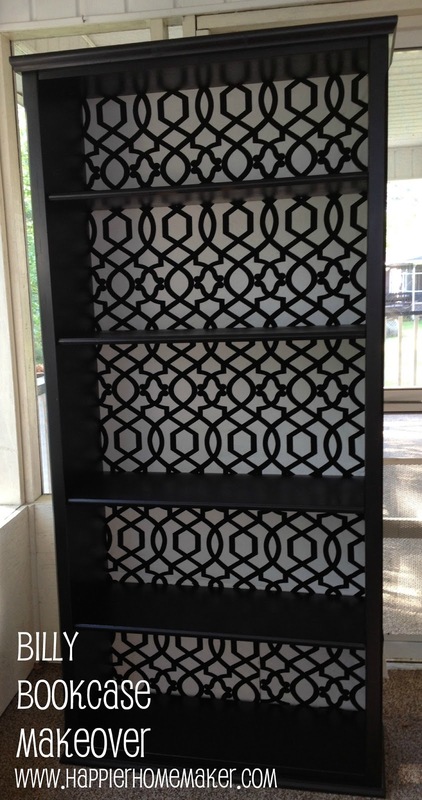 My husband and I bought this bookcase shortly after we were married. It has through the years been in our living room, dining room, and the boy’s playroom. It’s very sturdy-the sides, top and bottom are solid wood and the back is a thin sheet of pressed wood. With the upcoming move I have decided to nix the playroom in favor of a family room. I don’t want a lot of toys in the room-just games, puzzles, a tv, and I am hoping to homeschool for the most part in this room as well. That being said I wanted to give our bookcase a little makeover before the move. 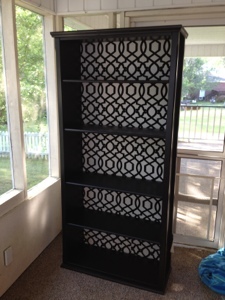 My first step was to spray paint the entire bookcase black. 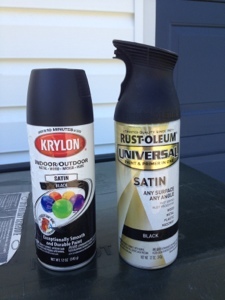 For this I chose Rustoleum Universal in Satin Black because it is a paint and primer all in one. 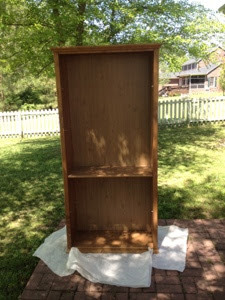 It took me about three and a half cans to spray the entire bookcase. 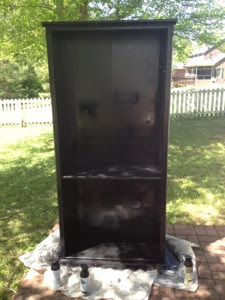 I originally bout three and tried to use another Krylon spray paint to finish it off but as you can see the primer in the Rustoleum made a huge difference and it was off to Lowes for a fourth can! 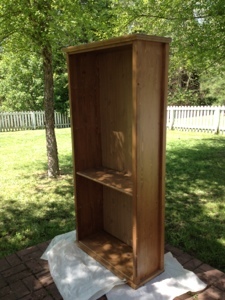 After the bookcase was painted my husband took off the back panel for me. 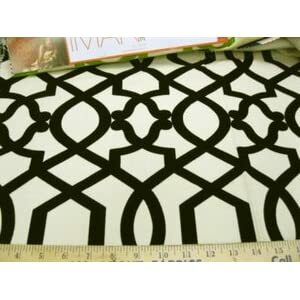 I bought this great fabric super cheap on eBay a few weeks ago. It is called Sultana by Iman. 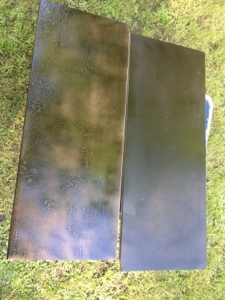 After the back was covered we nailed it back on and our transformation was complete! (Please excuse it’s location on the porch-the house is half-packed!) 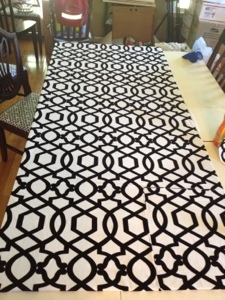 I can’t wait to see it in the family room once we move! 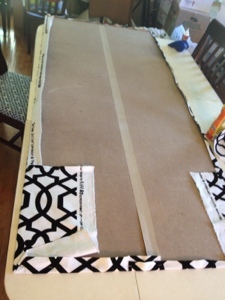 Clean Your Home in ONE Hour! Free Printable Guide!